BURLINGTON – Despite the chilly temperatures dropping below -20 F with the wind, a crowd of neighborhood onlookers were out early Monday morning to see the match-up between a local teenager and her neighbors’ snow blower. Jane Henry, a 17-year-old BHS student, has been shoveling her neighbor’s driveways and sidewalks for years, but had recently complained about the number of snow blowers taking away her business. Henry posted flyers around the neighborhood, challenging anyone with a snow blower to a sort of snow clearing duel, in which she claimed to be able to finish more quickly, and with better results. A common complaint of Henry’s is that a machine will not get that last layer of ice or frozen snow the same way a shovel will. After a few days of posting, Henry had herself a challenger. Ian O. Greenbrier accepted her invitation and they determined to have it out after the next significant snowfall, which was decided to be a snowfall of more than three inches. 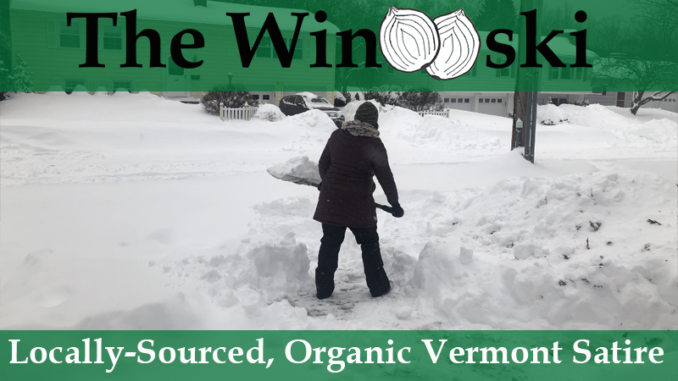 Jane Henry finished her work and fell, with her shovel in her hand, as the last scoop of snow flew through the air, and was taken to the UVM Medical Center to be treated for dehydration and exhaustion. Ian O. Greenbrier accepted his defeat graciously, although he still plans to use his snow blower in the future, as he says it is preferable to a hospital stay. A brilliant short story. I love you took an old fable and made it new and of Vermont. And I and my sons will all attest that the shovel IS superior to the noisy snow blowers. Better for the planet, better for the heart.